The Purdue Online Writing Lab (OWL) is an educational website that offers tons of excellent free writing resources for students and writers. 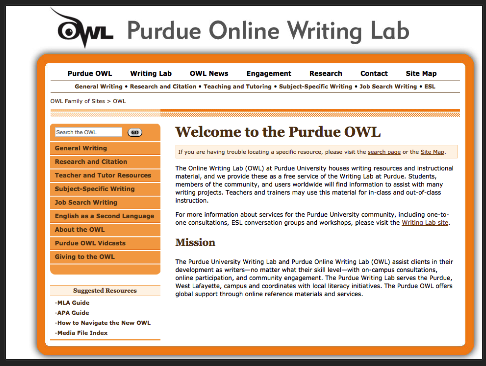 OWL, which belongs to Purdue University, has a huge online library that features a wide variety of materials covering different writing-related topics such as grammar and mechanics, professional writing, APA and MLA formatting guides, resume writing, research and citation tips, subject-specific writings and many more. OWL is definitely a must have resource for research students. It can help them in the writing and formatting of their research papers and instruct them on the mechanics of stylistic writing. It also offers free detailed guides on how to properly cite sources in both APA and MLA styles with illustrative examples and hyperlinked materials. You can use the search functionality in the website to quickly locate writing resources and instructional materials. Head over to The Purdue Online Writing Lab to learn more.